Totin, Edmond Segnon, Alcade Schut, Marc Affognon, Hippolyte Zougmoré, Robert Rosenstock, Todd and Thornton, Philip 2018. Institutional Perspectives of Climate-Smart Agriculture: A Systematic Literature Review. Sustainability, Vol. 10, Issue. 6, p. 1990. Besio, Cristina and Pronzini, Andrea 2014. Morality, Ethics, and Values Outside and Inside Organizations: An Example of the Discourse on Climate Change. Journal of Business Ethics, Vol. 119, Issue. 3, p. 287. Gardoni, P. and Murphy, C. 2011. Evaluating the Source of the Risks Associated with Natural Events. p. 342. Murphy, Colleen and Gardoni, Paolo 2011. Evaluating the Source of the Risks Associated with Natural Events. Res Publica, Vol. 17, Issue. 2, p. 125. Harris, Paul G. 2010. China's Environmental Crisis. p. 153. HARRIS, PAUL G. 2008. Climate Change and Global Citizenship. Law & Policy, Vol. 30, Issue. 4, p. 481. Johnson, Genevieve Fuji 2007. Discursive Democracy in the Transgenerational Context and a Precautionary Turn in Public Reasoning. Contemporary Political Theory, Vol. 6, Issue. 1, p. 67. Okereke, Chukwumerije 2006. Global environmental sustainability: Intragenerational equity and conceptions of justice in multilateral environmental regimes. Geoforum, Vol. 37, Issue. 5, p. 725. Paterson, Matthew 2006. Palgrave Advances in International Environmental Politics. p. 54. Gardiner, Stephen M. 2004. Ethics and Global Climate Change. Ethics, Vol. 114, Issue. 3, p. 555. 1 For the most authoritative treatment of climate change science, effects, and policy options, see Intergovernmental Panel on Climate Change, Climate Change 2001, 3 vols. (Cambridge: Cambridge University Press, 2001). 2 See Jamieson, Dale, Morality's Progress: Essays on Humans, Other Animals, and the Rest of Nature (Oxford: Oxford University Press, 2002), pp. 282–95. 3 Athanasiou, Tom and Baer, Paul, Dead Heat: Global Justice and Global Warming (New York: Seven Stories Press, 2002), p. 6; emphasis in original. 4 Harris, Paul G., International Equity and Global Environmental Politics: Power and Principle in U.S. Foreign Policy (Aldershot, U.K.: Ashgate, 2001). 5 For recent summaries of some ethical, legal, and practical justice considerations in this context, see Drumbl, Mark A., “Poverty, Wealth, and Obligation in International Environmental Law,” Tulane Law Review 76 (March 2002), pp. 843–960; Harris, International Equity and Global Environmental Politics; Jamieson, Morality's Progress., pp. 296–307; Paterson, Matthew, “Principles of Justice in the Context of Global Climate Change,” in Luterbacher, Urs and Sprinz, Detlef F., eds., International Relations and Global Climate Change (Cambridge: MIT Press, 2001), pp. 119–26; and Ellen Wiegandt, “Climate Change, Equity, and International Negotiations,” in Luterbacher and Sprinz, eds., International Relations and Global Climate Change, pp. 127–50. 6 Munasinghe, Mohan, “Analyzing Ethics, Equity and Climate Change in the Sustainomics Trans-Disciplinary Framework,” in Pinguelli-Rosa, Luiz and Munasinghe, Mohan, eds., Ethics, Equity and International Negotiations on Climate Change (Northampton, Mass. : Edward Elgar, 2003), p. 84. 7 See Jamieson, Dale, “Climate Change and Global Environmental Justice,” in Miller, Clark A. and Edwards, Paul N., eds., Changing the Atmosphere: Expert Knowledge and Environmental Governance (Cambridge: MIT Press, 2001), pp. 287–307. 8 Muylaert, Maria S. and Pinguelli-Rosa, Luiz, “Ethics, Equity and the Convention on Climate Change,” in Pinguelli-Rosa and Munasinghe, eds., Ethics, Equity and International Negotiations on Climate Change, p. 149. 9 Harris, , International Equity and Global Environmental Politics. 10 Athanasiou, and Baer, , Dead Heat, p. 65. 12 Ibid., pp. 47–51. See also Agarwal, Anil and Narain, Sunita, Global Warming in an Unequal World: A Case of Environmental Colonialism (New Delhi: Centre for Science and Environment, 1991), pp. 171–99; and Meyer, Aubrey, Contraction and Convergence: The Global Solution to Climate Change (Totnes, U.K.: Green Books, 2000). 13 Athanasiou, and Baer, , Dead Heat, p. 37. 16 Agarwal, Anil, Narain, Sunita, and Sharma, Anju, “The Global Commons and Environmental Justice: Climate Change,” in Byrne, John, Glover, Leigh, and Martinez, Cecilia, eds., Environmental Justice: Discourses in International Political Economy (New Brunswick, N.J.: Transaction, 2002), pp. 171–99. 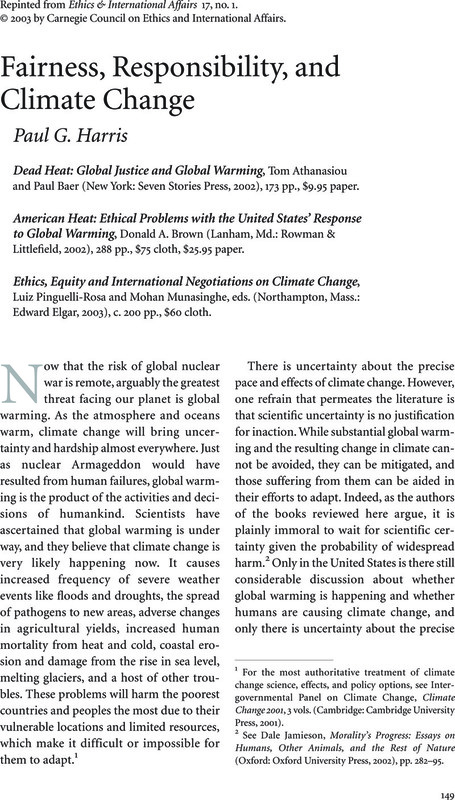 17 Brown, Donald A., American Heat: Ethical Problems with the United States' Response to Global Warming (Lanham, Md. : Rowman & Littlefield, 2002), p. xv. 19 Athanasiou, and Baer, , Dead Heat, pp. 41–42. 20 Atal Bihari Vajpayee, “Speech of Prime Minister Shri Atal Bihari Vajpayee at the High Level Segment of the Eighth Session of Conference of the Parties to the UN Framework Convention on Climate Change New Delhi,” October 30, 2002; available at http://unfccc.int/cop8/latest/ind_pm3010.pdf. 21 I first shared some of these comments in Paul G. Harris, “A Political Setback in the War on Global Warming,”South China Morning Post., November 21,2002, p. 18. 22 Jamieson, , Morality's Progress, pp. 305,306.